Both plentiful and beautiful, pink tourmalines add color and flair to any outfit. Tourmaline itself is so plentiful that it is not synthesized by laboratories. However, just because tourmaline is not lab-created does not mean that fake pink tourmalines do not exist. Glass, plastic, or cheaper gemstones have been sold as counterfeit pink tourmalines. Knowledge of the properties that are unique to pink tourmalines will safeguard consumers against purchasing fake pink tourmalines. Perform a scratch test to observe the hardness of your gemstone. Tourmalines are extremely hard, rating a 7 on the Mohs Scale of Hardness. Find a discreet spot on the tourmaline and gently rub a steel knife blade against the stone. Steel knife blades are generally a 5.5 on the Mohs Scale of Hardness. If the blade scratches the stone, it means that you are dealing with a fake stone that is much softer than a genuine pink tourmaline. Observe your pink tourmaline under a bright artificial light. 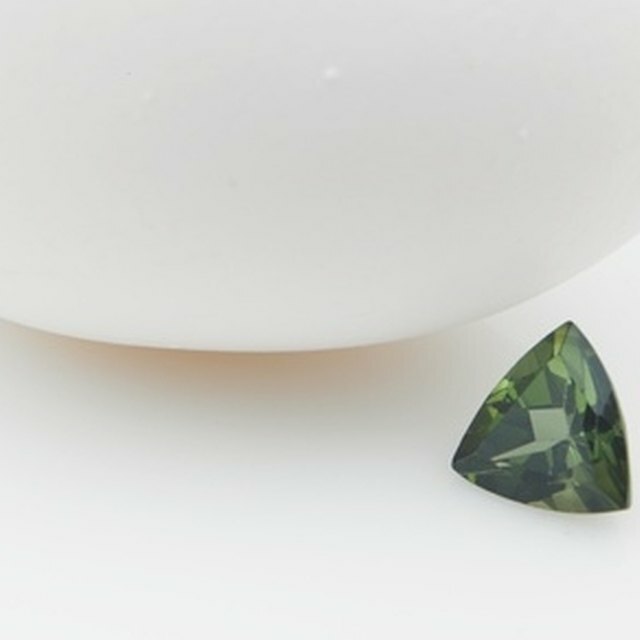 Genuine tourmalines change color under artificial light, displaying a brownish undertone. If your stone is billed as a pink tourmaline and it does not display this undertone when exposed to artificial light, then you are likely looking at a fake gemstone. The only exceptions to this rule are rubellites, a vibrant, reddish pink tourmaline that do not change under artificial light. Examine the stone closely for inclusions. These will look like small scratches and fractures within the stone, and are commonly found in pink tourmalines. If your tourmaline is completely free of scratches and inclusions and looks too perfect to be true, it is probable that you are looking at a fake or synthetic pink tourmaline. Consult a professional jeweler if you suspect that you have purchased a fake pink tourmaline. Since pink tourmalines are not rare, it is unusual that someone will go to the trouble of counterfeiting them. However, rubellites are expensive and rare, especially when the specimens are large. Jewelers have powerful microscopes at their disposal that can make it easier to detect a fake tourmaline. Always ask to see the certificate of any gemstone that your purchase. Reputable vendors will have their stones certified by a trusted organization such as the Gemological Institute of America or the American Gemological Society. Mazzaferro, Ann. "How to Tell a Synthetic Pink Tourmaline." Sciencing, https://sciencing.com/tell-synthetic-pink-tourmaline-8610223.html. 25 April 2017.